I don’t usually cover reports of the Scrutiny of Acts and Regulations Committee in detail on this blog. Given my job advising SARC on ‘human rights’ (i.e. the Charter), it’d be invidious to engage in the kind of detailed critique I mete out to judgments and the like. Criticism of the reports (which are the Committee’s, and may or may not be based on drafts I prepare) would either be a breach of parliamentary privilege or some sort of weird self-flagellation. Given the role SARC has taken on providing some scrutiny of Statements of Compatibility, laying into them is also tricky. But that’s a pity, as SoCs and SARC Charter reports form the overwhelming majority of Charter analysis out there at the moment. But I do try to note developments in the parliamentary dialogue, and there are a number of interesting ones in Committee’s final Alert Digest for the year. But what is a ‘report’? Charter s. 30 says what the report has to be about, but it is silent as to the form of the report. Finding an appropriate style for Charter reports is the trickiest part of my job, much tougher than reading bills and researching the wide world of human rights law. The report has to be simultaneously: (a) accessible to lay parliamentarians; (b) defensible in its legal analysis; (c) parliamentary in its language; (d) faithful to Charter s. 30; and (e) as brief as possible. A further foible – familiar to e-mail users – is the difficulty of getting the tone right, with what are, in a sense, critiques of others’ work. These various priorities, as they say in sentencing judgments, ‘pull in different directions’. Given SARC’s tight timelines, it’s impossible to reinvent the stylistic wheel for each issue. But, in these early years, it’s also important not to get trapped by an initial approach. The government intends to address the situation where an offender receives an award of damages from the state and therefore has a much improved financial situation. Victims can then choose to take advantage of that improved financial situation by taking their own legal action in the knowledge that there are assets that may satisfy a successful judgement. The government is aware of the perceived inequity when offenders are seen to use the law for their own purposes through pursuing compensation arising from their circumstances in custody. This bill represents a step in addressing that inequity. 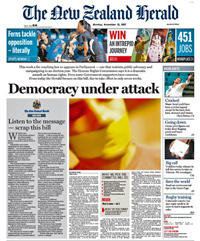 The Bill has its origins in a political debate in New Zealand about claims being made under its Bill of Rights Act (which, in contrast to the Charter, creates both a cause of action for breach of human rights and a remedy of damages.) Challenges to the NZ Act have to date failed on procedural grounds. The Centre has grave concerns about the impact that the Bill would have on the following human rights. The rights listed below are protected under the Charter at the sections indicated. (a) The right to recognition and equality before the law (section 8). (b) The right to privacy and reputation (section 13). (c) The right to protection of families and children (section 17). (d) Property rights (section 20). (e) The right to humane treatment when deprived of liberty (section 22). (f) The right to fair hearing, including the right to equal access to courts (section 24). (g) The right to an effective remedy (which is fundamental to the protection of all human rights). …The Centre considers the premise of the Bill to be incompatible with the human rights outlined above… , which are rights that the Victorian government commendably seeks to protect and promote in the Charter. As such, the Centre recommends that the Bill be withdrawn in its entirety. The Committee observes that the information contained in the notice – that the prisoner has been a victim of a civil wrong committed by the state and is the recipient of an award of more than $10,000 – is potentially sensitive information, particularly given the vulnerabilities of many prisoners. The Committee also observes that this requirement is a mandatory one regardless of the circumstances and, in particular, overrides any confidentiality clause contained in an agreement between the state and the prisoner (see new section 104ZB.) The Committee therefore considers that new section 104Y may engage prisoners’ Charter right against arbitrary interferences in their privacy. The Committee was also concerned that the requirement may override contrary court orders and laws. SARC’s report also raises Charter concerns about the exemption of some offenders from the new County Court Koori division and the reverse onus defence of due diligence in an offence relating to factory openings on ANZAC Day.